Human Adiponectin, Fc Tag (ADQ-H5250) is expressed from human 293 cells (HEK293). It contains AA Glu 19 - Asn 244 (Accession # NP_001171271). The protein has a calculated MW of 50.2 kDa. The protein migrates as 54-58 kDa under reducing (R) condition (SDS-PAGE) due to glycosylation. 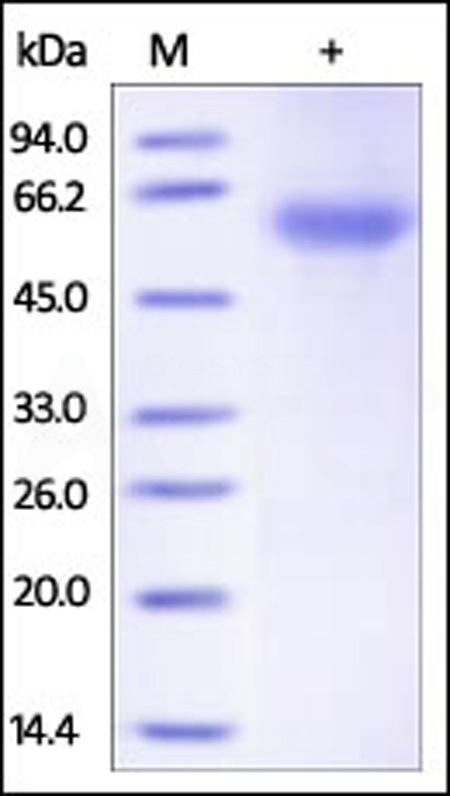 Human Adiponectin, Fc Tag on SDS-PAGE under reducing (R) condition. The gel was stained overnight with Coomassie Blue. The purity of the protein is greater than 92%. Adiponectin is also referred to as GBP-28, APM1, ADIPOQ, ACDC and Acrp30, is a secreted protein which contains one C1q domain (commonly called the globular domain) and onecollagen-like domain. Adiponectin / ADIPOQ is synthesized exclusively by adipocytes and secreted into plasma. ADIPOQ is important adipokine involved in the control of fat metabolism and insulin sensitivity, with direct anti-diabetic, anti-atherogenic and anti-inflammatory activities. Adiponectin antagonizes TNF-alpha by negatively regulating its expression in various tissues such as liver and macrophages, and also by counteracting its effects. Acrp30 Inhibits endothelial NF-kappa-B signaling through a cAMP-dependent pathway and may play a role in cell growth, angiogenesis and tissue remodeling by binding and sequestering various growth factors with distinct binding affinities, depending on the type of complex, LMW, MMW or HMW. (1) Nakano Y., et al., 1996, J. Biochem. 120:803-812. (2) Yamauchi T., et al., 2001, Nat. Med. 7:941-946. (3) Richards A.A., et al., 2006, Mol. Endocrinol. 20:1673-1687.